I do hope we all take a few minutes and remember 9/11 this Tues. It had an effect on all of us and I am sure it was one of those events we all remember where we were on that crystal clear blue sky day. The aftermath is something we are still paying the price for. Wrote a chapter in the history books that I hope never happens again but it is a reminder of how fragile we all are. 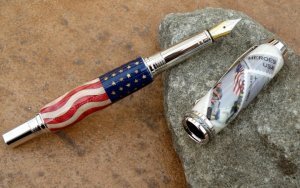 Being this is a pen turning forum, to tie this together here is a front page photo of a tribute pen made by Eric (aka Buzzzz4) He did a great job on this pen and I find it fitting to show it again here. Hope he does not mind even though he has not been here for awhile now. Hope everything is well. Also the thread that went with it. John, beautiful job. Did you do that freehand or on a CNC machine? Either way still magnificent work and a beautiful way to honor that horrible day in our Nation’s history and the thousands of volunteers that rushed to the scene to help. God Bless America and our first responders. Remember no matter how far you stretch the envelop, it is still stationary. I am a scroller and work with a scrollsaw and this was done with one. The wood is red oak and the backer is a piece of blue stained glass. There is a pattern out there for this. The thing I remember most was how clear that day was and from the building I was working on in NJ we could see the towers very clearly and watched this thing unfold before our eyes. After the first tower fell and we could see this gaping hole in the skyline we knew we were in trouble. State Troopers soon swept in and shut the Data center down where we were working on. It turned out the Government used that facility to store files and info and no one knew what was the next target. Forever etched in my mind. So many lives lost and all they did was go to work that day. Last edited by jttheclockman; 09-10-2018 at 01:58 PM. Now that is a nice work John. I was only a few blocks away. Lucky to be here. John, wherein NJ do you live? I too live in NJ (South Jersey approx 41 miles NW of AC). I have a scroll saw as well but i have not done anything real with it yet so I am still a novice. I am in central NJ RT 22 area. I was at work when all this occurred. I was in the south tower of TWTC in October, 1998. When my wife heard the news, she said she got sick to her stomach, realizing that I might have been there at the time of the attack or if the attack had been planned earlier.